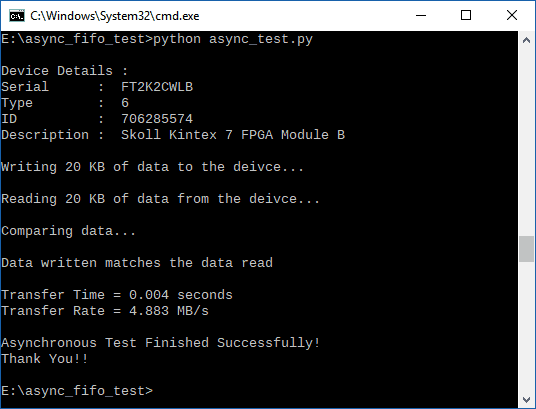 The FTDI FT2232H USB 2.0 chip on-board Neso, Skoll and Styx provides users with a FIFO interface for data transfer between FPGA and host PC. The FT2232H chip features two channels or ports, which can be configured into various modes like UART, FIFO, JTAG etc. On Neso and Skoll, channel A is used for FPGA configuration and flash programming, whereas Channel B is available for custom usage. 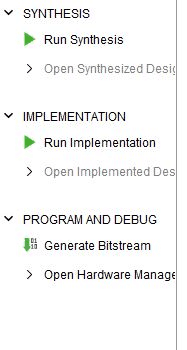 On Styx, Channel B is used for FPGA configuration and flash programming, whereas channel A is for custom usage. This article demonstrates communication between host and the board using Asynchronous FIFO mode via boards’ respective channels of FT2232H. The Channel B of FT2232H in case of Neso and Skoll (Channel A for Styx), when configured as FIFO, acts as a USB-FIFO bridge between host and FPGA. This article is applicable for Neso Artix 7 FPGA Module, Skoll Kintex 7 FPGA Module as well as Styx Xilinx Xynq FPGA Module. You can follow this article with any of the three boards. Let’s get started! Download and install Vivado Board Support Package files for your respective board from here. Follow the README.md file on how to install Vivado Board Support Package files for Numato Lab boards. 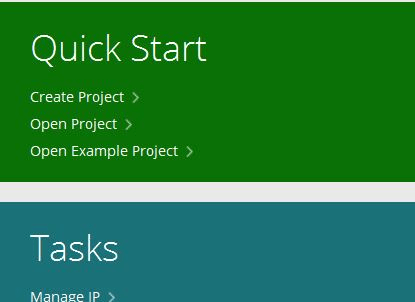 Open Vivado and select ‘Create Project’ from the Quick Start Section. Click ‘Next’. 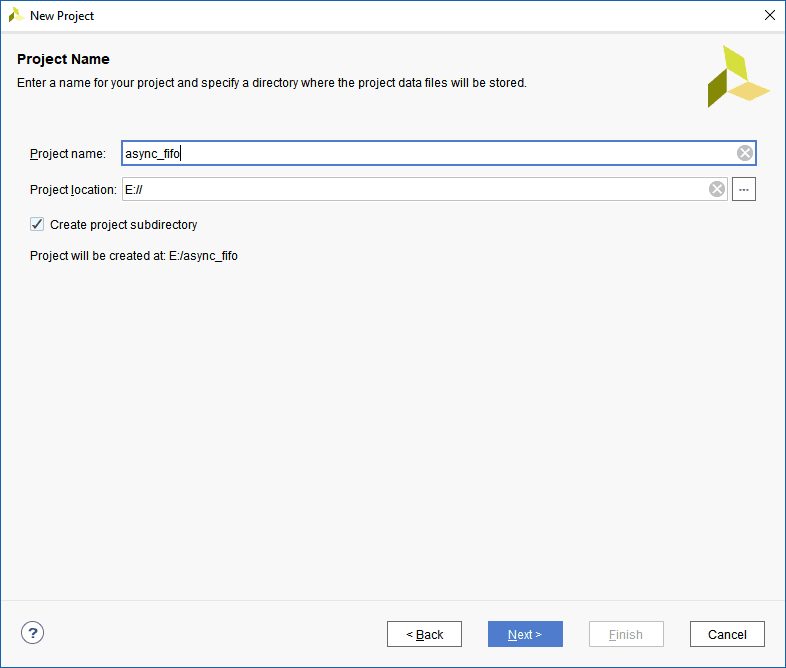 In Project Name tab, type in a project name and select a convenient project location. 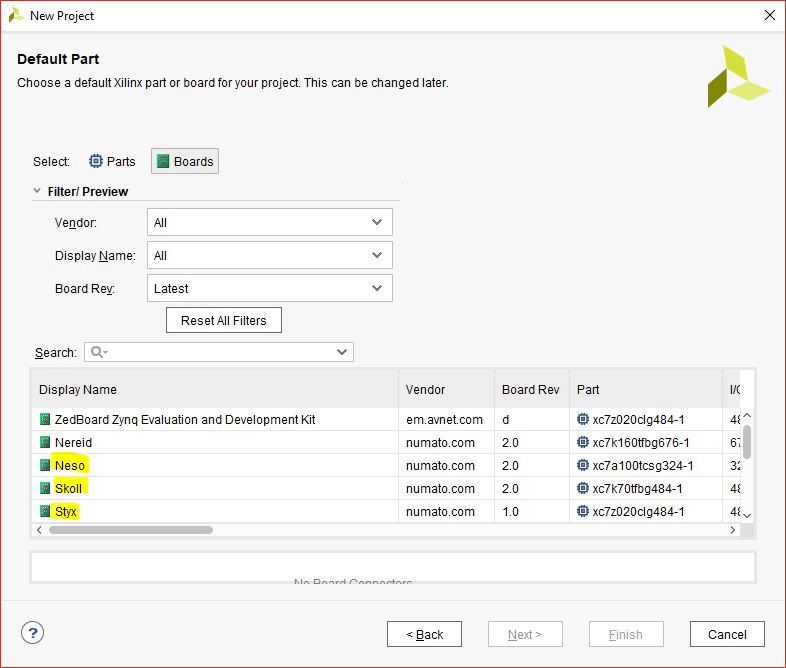 Click Next without making any changes till you see the ‘Default Part’ tab and select your board from ‘Boards’ option as shown in the image below. If the boards are not listed, make sure board support files are installed correctly. 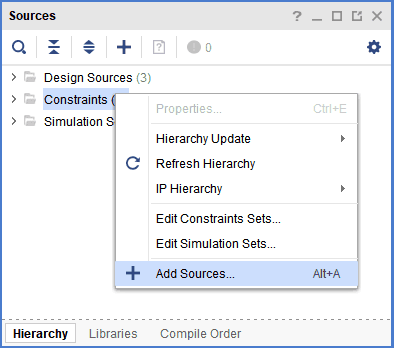 Right-Click ‘Design Sources’ and select ‘Add Sources’. 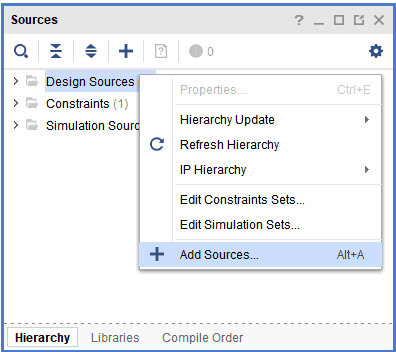 It will open a configuration window for adding Verilog files. Download and extract the RTL source files from here. 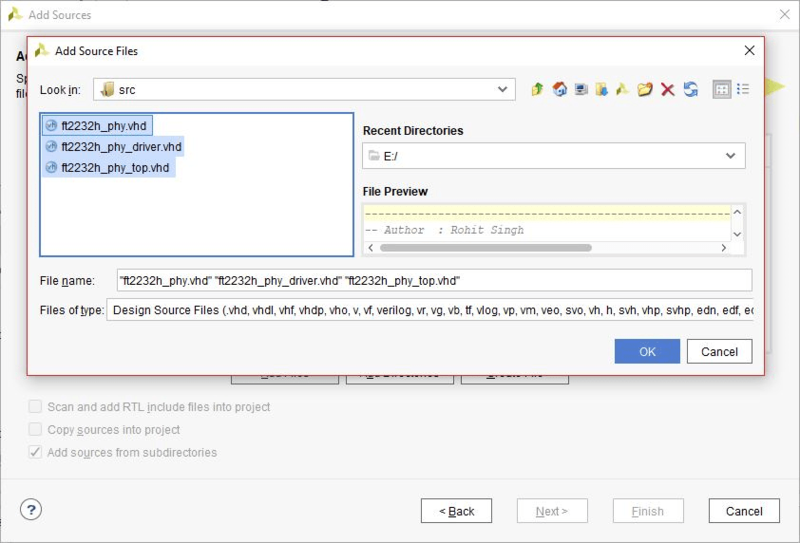 Click ‘Add Files’, select all files and add them to the project. rd_n: It is an active low signal. When asserted, data is driven onto ‘data’ bus from FIFO. wr_n: It is an active low signal. When asserted, data from ‘data’ bus is driven into FIFO. 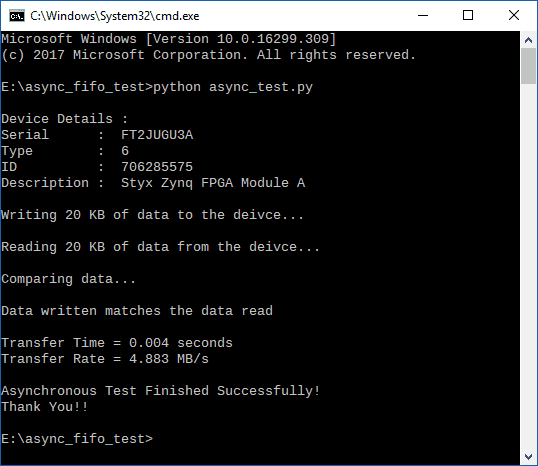 In the RTL code, FSM is implemented which checks if there is some data available for reading (indicated by pending_read), then the data is read by enabling rd_n signal. When there is some data to be written (indicated by pending_write), wr_n signal is asserted and incoming data is driven into FIFO. Click Next and then ‘Create File’. 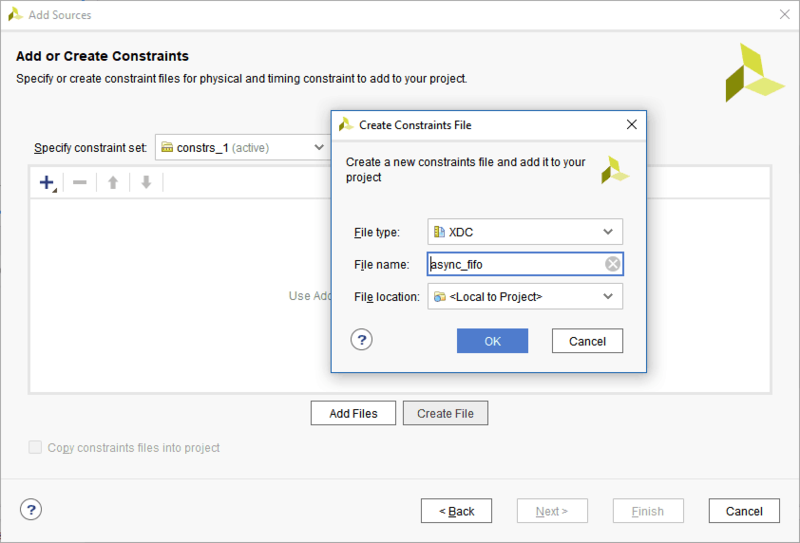 Enter a name for the constraints file and Click Finish. 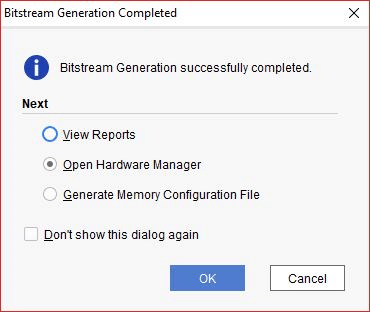 After Successful generation of bitstream, select “Open Hardware Manager” and Click OK.
Click ‘Open target’ and ‘Auto Connect’. It will connect to the board. Make sure you have connected the Board to JTAG, Power supply and USB. 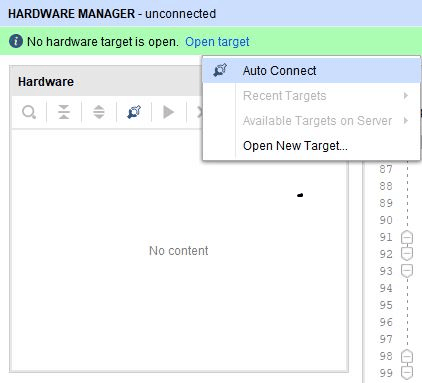 Click ‘Program Device’. Dialog window for programming will open. Program the bit file by clicking ‘Program’. Change FT Prog settings as follows: Go to Device:0 -> Hardware Specific -> Port B -> Hardware and select RS245 FIFO. Now goto Hardware Specific -> Port B -> Driver and select D2XX. Change FT Prog settings as follows: Go to Device:0 -> Hardware Specific -> Port A -> Hardware and select RS245 FIFO. 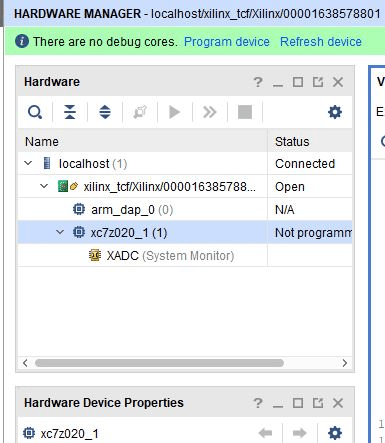 Now go to Hardware Specific -> Port A -> Driver and select D2XX. 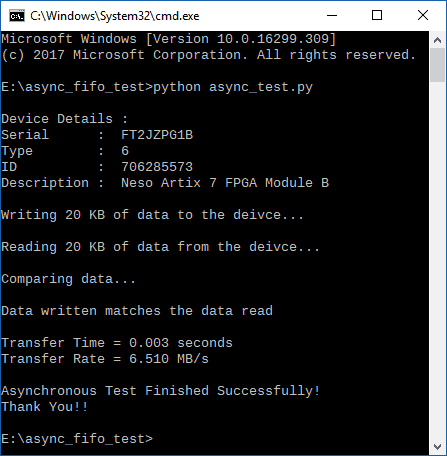 To check if Asynchronous FIFO is working as expected, write some data through FIFO, read it back and compare it. If the data written matches the data that is read then it means that the design is working fine.